Our Share Forward program makes all our business-minded friends laugh at us. "Way to lose money guys," is often their first comment. But we think differently; for us it's a win-win all the way around. 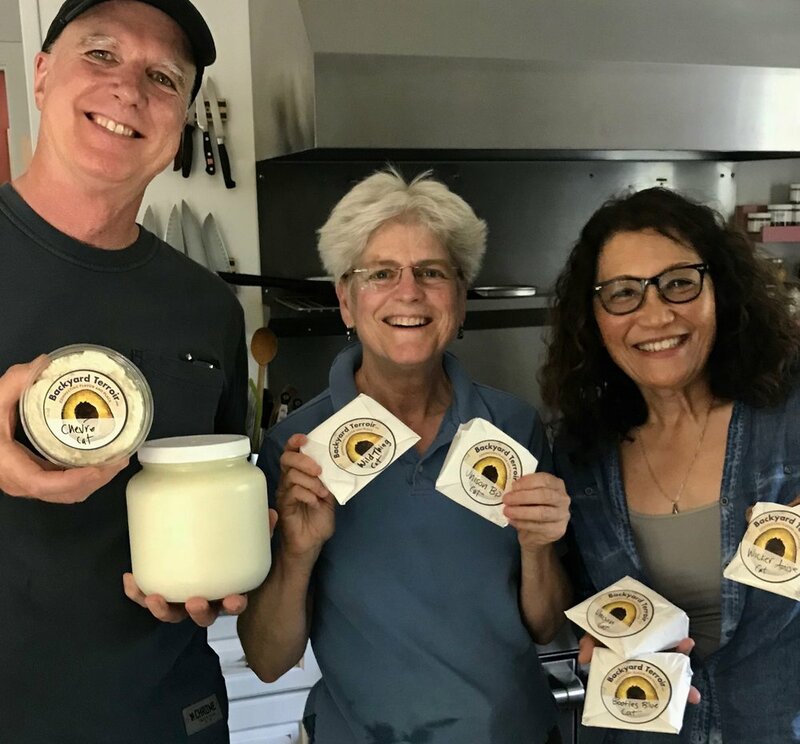 We get to make pounds of cheese and meet lots of great people, our Share Forward donors take home delicious, unique farmstead cheese, and worthy nonprofit organizations receive monthly donations! What's to laugh at? We love to make cheese using some outside-of-the-box, dare I say subversive, cheesemaking techniques. We use only raw milk from our own goats and cows, our cheeses are cultured with our native microbes instead of commercial starters, and so, we make cheeses unique in the world. This elemental-style of cheesemaking doesn't sit well with commercial practices, so getting a liscence to sell the hundreds of pounds of cheese we make each year isn't really an option. Oh my gosh, our wheels of cheese started piling up around us! We realized quickly, it had to go somewhere! With our Share Forward program, our cheese is now enjoyed by anyone eager to come taste original American farmstead cheese. You can signup, come visit the farm for a pick-up, and then donate the value of the cheese you take home to the nonprofit of your choice. It's as easy as that. Share Forward accomplished! On our launch weekend we started small, but still we raised over $1,000! And, the list of organizations that benefited is just the beginning: Laguna Santa Rosa Foundation, the California Native Plant Society, Sebastopol Senior Center, Zen Center in Santa Rosa, Farm to Consumer Legal Defense Fund, and the Good Meat Project. We've now scheduled monthly Share Forward weekends throughout the year. Word is spreading, our Share Forward sign-up list is filling fast! Best of all, our wheels and yogurt are now off the farm, being enjoyed by many happy cheese lovers...and now we have the room to make more!